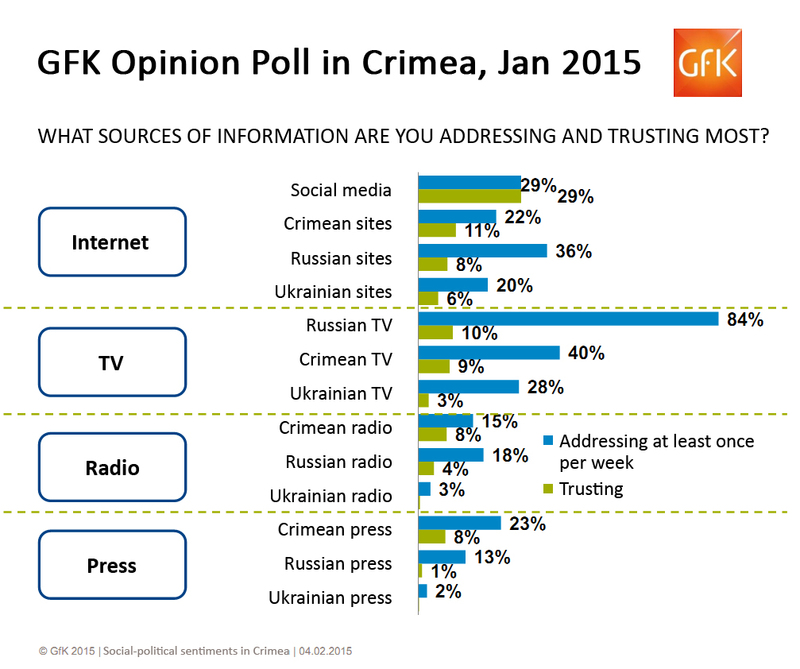 A few days ago an interesting study, “The Socio-Political Sentiments in Crimea,” was released by the Ukrainian branch of GfK, the well-known German social research organization, as part of the Free Crimea initiative. Intriguingly, the primary objectives of this project, launched with the support of the governmental Canada Fund for Local Initiatives, were to “debunk aggressive Russian propaganda” and to “reintegrate Crimea into Ukraine.” Thus the researchers can hardly be suspected of being Russian sympathizers. So let’s take a look at the results. 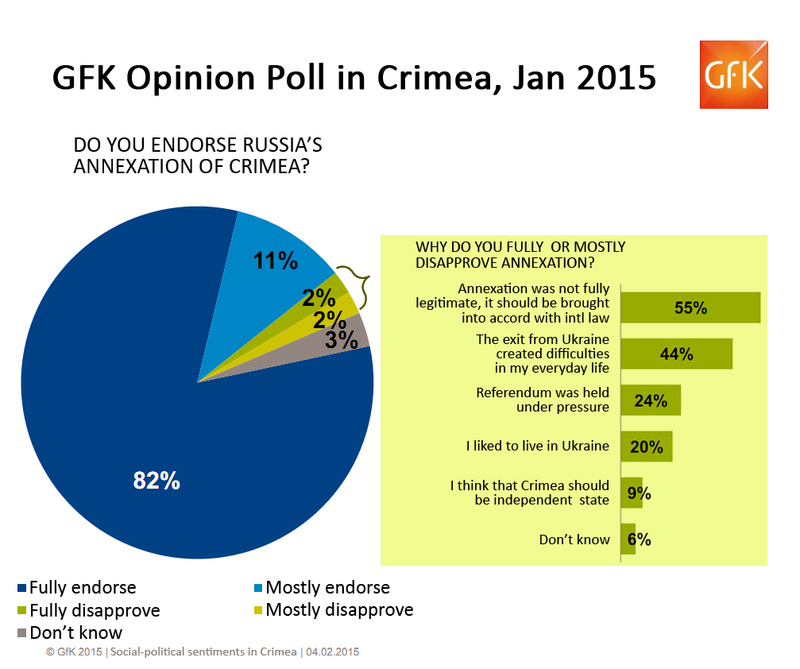 The attitudes of Crimeans were studied in January 2015. This representative sample included 800 respondents living on the peninsula, from all age and social categories. The poll had an error margin of 3.5%. In answer to the most important question: “Do you endorse Russia’s annexation of Crimea?” 82% of the respondents answered “yes, definitely,” and another 11% – “yes, for the most part.” Only 2% gave an unambiguously negative response, and another 2% offered a relatively negative assessment. Three percent did not specify their position. We feel that this study fully validates the results of the referendum on reunification with Russia that was held on March 16, 2014. At that time 83% of Crimeans went to the polling stations and almost 97% expressed support for reunification. Ukrainians continue to question whether this was a credible outcome, but it is now backed up by the data obtained by the Germans. The 82% of the respondents who expressed their full confidence in the results of the Russian election make up the core of the electorate who turned up at the ballot boxes on March 16, 2014. These figures are also relevant in terms of another important question. The former chairman of the Mejlis of the Crimean Tatars, Mustafa Dzhemilev, has repeatedly stated that all Tatars on the peninsula are opposed to reunification with Russia. Dzhemilev’s statements have been widely quoted by the media, which present them as entirely authoritative and undisputed. But let’s think about that – Crimean Tatars make up 12% of the Crimean population, yet only 4% of those polled conveyed disapproval of Crimea’s reunification with Russia. And that 4% very likely includes not only Tatars, but also Ukrainians and citizens of other ethnicities. There’s an inconsistency here. Of course further study is needed on this issue, but the results obtained by GFK cast doubt on whether Mustafa Dzhemilev or the entire Mejlis of the Crimean Tatars is an accurate barometer of the feelings of the Crimean Tatar community. Those few respondents who disapproved reunification were then asked “Why do you fully or mostly disapprove annexation?” Only 20% of them (i.e., less than 1% of the total sample) claimed that they preferred to live in the state of Ukraine. The most common response, offered by 55% of those who opposed reunification, was “Annexations was not fully legitimate, it should be brought into accord with the international law.” Which means that, in theory, they do not object to the idea of living in Russia, but rather question the legitimacy of the transition. No doubt it would be a good idea to hold such a referendum under the auspices of international legislation and in accordance with Ukrainian law. But would laws ever be passed that would grant Ukrainian regions the right to secede? Back in the totalitarian Soviet Union, Ukraine exercised its right to a referendum without a single shot being fired, while in “democratic Ukraine,” separatists are either burned alive as in Odessa, or are shot along with the elderly and children as is happening in the Donbass. In answer to a question about their financial circumstances, 21% of Crimeans said that in the last year their position had “improved significantly,” while another 30% claimed it had “somewhat improved.” Only 13% of that population has experienced a setback, to a greater or lesser extent. This suggests that, despite EU sanctions on the peninsula’s economy, and despite Ukraine’s partial blockade on communication from Crimea, the reunification with Russia has provided most Crimeans with material gains. But even among those who have not reaped those sorts of benefits, there are few signs of nostalgia for their old Ukrainian citizenship: although 13% of citizens have seen their financial well-being decline, only 4% disapprove of the reunification with Russia. These figures suggest that economic sanctions are an ineffective means of persuading the residents of the Crimea to view Ukraine more favorably. The results of the survey indicate that 28% of the residents of the peninsula regularly watch Ukrainian TV, and another 20% regularly consult Ukrainian news websites. This proves that no steps have been taken in Crimea to restrict access to Ukrainian sources of information, such as Ukraine has done in relation to Russian media. And now the moment of truth: “What is your opinion of what is being written by the Ukrainian media about Crimea?” Who could be a more objective judge on this issue than the residents of the peninsula themselves? Who else but they – who have been fated to experience all the pros and cons of both Ukrainian and Russian citizenship – could better evaluate the accuracy of the information being published? Perhaps no one. However, only 1% of those surveyed reported that the Ukrainian media “provides entirely truthful information” and 4% said it was “more often truthful than deceitful.” But 45% of respondents see “completely untrue information” on Ukrainian TV, and another 35% claim those broadcasts are “more often deceitful than truthful.” The rest either do not watch Ukrainian news programs or do not pay attention to information in those programs about Crimea. This is the verdict on the contemporary Ukrainian press, as handed down by an impartial panel of eight hundred jurors. But if those who shape the media coverage in Ukraine today are so biased in regard to Crimea, how can we expect them to report objectively on other critical problems associated with this country? Can we trust Kiev’s official stance on the tragedy of Malaysia Airlines Flight 17? Or on the causes of the humanitarian crisis in the Donbass? Or on the presence of Russian troops inside Ukraine? Or on the human fatalities in Odessa or the victims of the “Heavenly Hundred”? GfK’s study demands a clear answer to these questions. Konstantin Kosaretsky is the Ukrainian freelance journalist and writer. Pingback: TRANSCEND MEDIA SERVICE » Crimea: Was It Seized by Russia, or Did Russia Block Its Seizure by the U.S.? Pingback: Crimea: Was It Seized by Russia, or Did Russia Block Its Seizure by the U.S.?